Rome, May 1959. 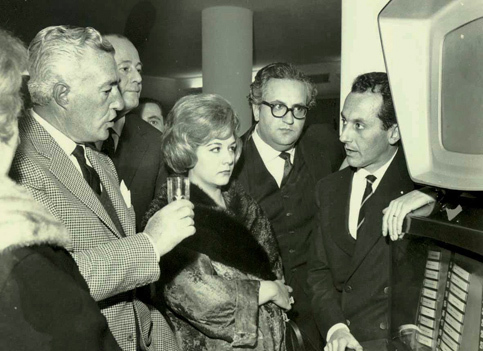 The great actor and film director Vittorio De Sica with chief executive of OMI Paolo Emilio Nistri present Cinebox at the Rome Trade Fair. Michele Bovi, it is your passionate and dedicated research that has revolutionized the history of musical videos: you have delved deep into the history and the roots of the Music Video that is in this day and age the main method of promoting music. Many world renowned experts in the audiovisual field (The American Lawyer Bob Orlowsky who studies and researches the history of Music Videos, the Danish historian of the Jukebox Gert J. Almind, Professor Charles Scagnetti who teaches at the University of Nice in France, Henry Keazor and Thorsten Wübbena who teach The History of Art at the Frankfurt University in Germany) unanimously cite your research that has established that the very first to produce one song Music Videos in Colour were in fact the Italians. For many years it had been erroneously assumed that the first colour music videos were either American or English. Whatever the musical media, be it a vinyl record, a CD, a DVD or an MP3, it is born and lives in direct symbiosis with the technology and sound reproducing equipment of its time. Over a reasonably short span of time, music has been reproduced on many different machines that range from antique clockwork turntable gramophones to today’s High Tech Digital Players. In 1981 the catchy term “Videoclip” was newly minted by MTV for the new market that blossomed thanks to MTV’s innovative and methodical large scale diffusion of music videos. The MTV had effectively distributed a constant flow of music videos onto the market and thus laid the groundwork for the large scale diffusion of music videos. Once again I underline the fact that it is the end user hardware that is important because it specifically determines the type of video software to be produced. Looking back, I think that the first breakthrough musical video that one could call a newborn child, was “Bohemian Rhapsody” by “The Queen” produced by Bruce Gowers in 1975. But, let us not forget that songs and music illustrated by moving images, directed and produced with imaginative fantasy that went way beyond a simple stage representation, had already been shown on television all around the world. They featured firstly Tony Bennett and in the late sixties The Beatles. The first short footage films that were made to promote music go back to 1939 when the “Mills Novelty Company” of Chicago invented and marketed the “Panoram” which was a wooden cabinet with a screen upon which images were projected from behind using a 16 millimetre celluloid film. These shorts were called “Soundies” that featured the Greats of Jazz ranging from Bessie Smith to Duke Ellington. It was just one continuous non stop sequence of 8 songs on one reel of black and white celluloid film. In other words it was a short musical film. The only true anchestor of today’s music videos were the short one song colour films produced specifically for the Italian Cinebox that was manufactured by OMI, Ottico Meccanica Italiana di Roma (Italian Optical Mechanics) in Rome based upon the designs of its inventor Pietro Granelli (Rome 1918-Piacenza1975). The Cinebox was distributed by a company in Milan called SIF, Società Internazionale di Fonovisione (International Company of Sound and Vision) which was owned by the two brothers Angelo and Benvenuto Bottani. The Cinebox ran 40 one song colour films that were individually selected from a push button control panel. It was officially presented to the press on the 11th of April 1959 and it was publicly christened by the great actor and film director Vittorio De Sica along with “The queen of Italian song” Nilla Pizzi who had won the San Remo Italian Song Festival of 1951. According to the recollections of Paolo Emilio Nistri, who was the Chief executive of OMI and is currently the vice president of The Foundation of the Roman Savings Bank Cassa di Risparmio, the very first colour music video was of a song entitled “Altagracia” sung by the Cuban singer Don Marino Barreto Junior. It was produced in the Roman studios of the “Istituto Luce” (The institute of Light) by the film director Domenico Paolella and it was developed in the laboratories of “La Microstampa” owned by Franco Iasiello. This music video ”Altagracia” is beyond any reasonable doubt, the very first musical video that was ahead of its time. More or less at the same time the French unveiled an invention that was curiously similar to the Italian Cinebox. It was called the “Scopitone”. It showed 36 musical films in colour. I do wonder where they got the idea from? The “Scopitone” was presented at the Paris Fair the 14th of April 1960. That is to say, one year after the Cinebox had been unveiled in April 1959 in Rome. The Scopitone was designed by Fréderic Mathieu who at that time was the General Director of the “Compagnie d’application Mécaniques à l’Eletronique au Cinema et à l’Atomistique, (The company of electric mechanical applications in cinema and Atomistics) that was an affiliated company of the gigantic Paris based electronics company TSF (Telegraphie Sans Fil) (Telegraph without wires). Mathieu did not copy the Cinebox of Engineer Granelli. How can you be so sure he did not copy it? Because I am convinced that the machines that ultimately became the Cinebox and the Scopitone in realty already existed and had been in use during the second World War in military intelligence. No! I am reasonably sure these optical machines were in use in intelligence and spy work. I must explain that both the Italian company CAMECA and their French counterpart were important industries in the military sector. Both were specialized in optical instruments for navigation and aerial photography that used stereoscopic images to make three dimensional maps. Just try to imagine the advantage during the war years of being able to push a button and instantly see a short film and a hear a commentary of a strategic target without having to rummage through many spools of films to find the right footage that refers to the right military target. Just like a computer of today! Something like the spy satellites of today? In a certain sense yes, but many years before Spy-Satellites existed. Futuristic thinking! Let us not forget that the Italian OMI had about a thousand employees on their payroll during the war and they had conceived and designed a new cipher machine as an alternative to the Enigma cipher. Also Umberto Nistri, the father of Paolo Emilio Nistri, was a friend and close collaborator of the famous military aviator Italo Balbo and he was a frequent visitor to the house of the reigning King Savoia. After the war the OMI company acquired the American government as a client and at the same time Umberto Nistri’s son, the industrialist Paolo Emilio Nistri, was a frequent visitor to the CIA in Langley and it was he who actually put the first Cinebox into production on the assembly line. 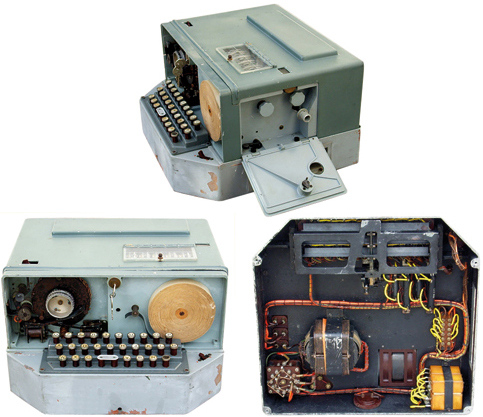 The original Top Secret Cipher machine that was used by the Italian Army, Navy and Air Force during the SecondWorld War. It was based on the principles and designs of the German Enigma cipher machine. Very limited numbers were manufactured from 1939 to 1940 by OMI (OtticaMeccanica Italiana) Nistri SA. It had five rotating disks for the codification and one rotating disk for writing. The keyboard had twenty-seven keys and a lever. Twenty-six keys were for the alphabet and one key was used for continuous movement. What is it that makes you so sure that the Cinebox and Scopitone were actually functioning during the war? In France during the nineteen fifties various inventors applied for patents for machines were very similar to the Scopitone. In some cases the applicants were taken to court. Eventually, all the law suites were won by the engineer Mathieu who was the patron of the firm CAMECA and he legally proved that the Scopitone project was already well underway just after the war when they were eagerly attempting to transform the enormous amount of obsolete war material into useful profit making machines. This specifically confirms what I already believe, that is, the machines already existed and were functional and working during the war both in France and in Italy as automatic viewers of films that contained highly classified strategic objectives and their existence was kept secret for a long time. Obviously, whoever had used or come into contact with these new fangled futuristic optical machines had started to realize their potential and future commercial possibilities and decided to have a go at it. The enormous success during the early 1950’s of the Juke-Box certainly illuminated the musical path to follow so patents were eagerly applied for. Strange but true, there has never erupted an argument or law suite as to who had effectively invented, patented and produced the first revolutionary Music Video Juke-Box. Evidently the high echelons of the two rival companies, the Italian OMI and the French CAMECA, both knew the truth, that their machines had already existed during the war, seemingly by gentleman’s agreement, they both went their own silent separate ways and never an argument ensued. Did anybody ever confute Pietro Granelli’s paternity of the Cinebox? No. In 1958, when some Italians were setting their sights on the French market, the CAMECA bought from an Italian Piedmontese inventor Teresio Dessilani (who had invented an inspired new type of electric razor) a patent that they then used in the development and making of the Scopitone. In 1959 the Milanese lawyers Vincenza Bavaro e Mario Giacomini formed a company called MGS (Movie General System) and they then applied for a patent in France for a different type of projector of sound tracked films called the Moviebox, but it was never built. Later in1961 the designs of this project of Mario Giacomini were bought by Angelo Bottani, the owner of the company SIF Società Internazionale di Fonovisione (The International Company of Sound and Vision) who were manufactures and distributors of the Cinebox. So in other words the competition between the Cinebox and the Scopitone was purely commercial and artistic? Yes. In the early days, both the OMI and the CAMECA veered towards cinema aiming to reconvert obsolete war material into a profitable commercial enterprise. The acronym that forms the name of the company CAMECA specifically refers to “Cinema”. Also in the early fifties Paolo Emilio Nistri founded two new companies affiliated to OMI: The company Cinefilm concentrated on reducing the cumbersome celluloid film of 35 millimetres to a more manageable 16 millimetres and the other company Cineindustria aimed to acquire a new clientele and to distribute the more compact films of gauge 16 millimetres. The boom in the sales of records (The worldwide success in 1958 of “Volare” sung by Domenico Modugno and in the same period revolutionary Rock and Roll and last but not least the French Author/Singers), convinced the Italians and their French counterparts that the market was ripe for the Video Juke-Box. It seems strange that contraptions of war can become instruments that divulge peace and pleasure: they became the vehicles for the diffusion of music and dance that stimulated the younger generations. It is stranger still, that after the OMI company went out of business the second series of Cinebox was produced by the MIVAL company situated in the North Italian town of Gardone Valtrompia in the county of Brescia. This new company was a subsidiary of the Beretta weapons and firearms. In fact, more often than one thinks, armaments and music seem to travel side by side. During the second world war many of the big record companies worked for the military and some continued in intelligence work long after the end of the war. It comes to mind the American troops in 1944 advancing through a war torn devastated Italy. The smiling soldiers won the hearts of the Italians with chewing gum, chocolate and cigarettes but their most long lasting gift was their wonderful happy go lucky Jazz and Boogie Woogie music. I often wonder if the Devils Rebel Rousing Rock and Roll of the fifties was a natural occurrence or if it was orchestrated from Up on high by a Big Brother because it completely seduced and subdued the younger generation and gave them a spontaneous and creative outlet for all the pent up sensations within that could have easily burst out and flowed in a less positive direction.